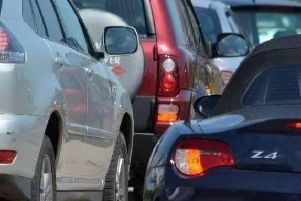 A three vehicle collision is causing long delays on the A47 Soke Parkway in Peterborough this morning, Monday March 7. The crash took place at 9.23am on the westbound carriageway at its junction with Thorpe Road. Police believe one vehicle was broken down and being loaded onto a trailer when another vehicle went into the back of it. The crash involved a silver Ford Transit, a silver Vauxhall Astra and a blue Ford Focus and the road was reopened at 10.50am. Police say those involved were taken to Peterborough City Hospital but there are no details of injuries at this time.